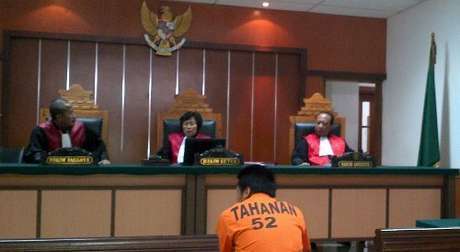 A hacker 'Cahya Fitrianta' sentenced to eight years in prison by the West Jakarta District Court judges for hacking into many economic websites to steal money and funding that money to terrorist groups. He is also ordered to pay a Rp 500 million ($51,000) fine. He is charged with breaking into many sites, for running online fraud of billions of dollars and fund that money to terrorist training in Poso, Central Sulawesi. Cahya was arrested in May last year in a Bandung hotel. The defendant, along with another man, Rizki Gunawan. Police in May arrested Rizki, accusing him of hacking a marketing firm’s website to steal money in order to fund militant training. They both accused of channeling money to terrorism suspect Umar Patek, who was sentenced this year to 20 years for his role in the 2002 Bali bombing. Meanwhile, the prosecutor decided to appeal because the sentence received is lower than demand and even it is lighter than the 12 years prosecutors.